Bordeaux, Port of the Moon, encompasses the historic centre of Bordeaux as an outstanding urban and architectural ensemble created in the Age of Enlightenment. A bend in the river Garonne has created a natural harbour here, and because of its shape it's called Port of the Moon. Bordeaux has been a commercial centre for ages, primarily based on its wine export. It was founded as a Roman settlement in 56 B.C. There's no doubt that Bordeaux is a very pleasant and liveable city. We arrived late in the evening (11 p.m.) and our taxi driver proudly pointed out all the monumental highlights: the bridge across the Garonne, the Place de la Bourse, the old city gates and the water mirror to name but a few. They are all flooded in light after it gets dark: a very fine sight. The next morning we did a self-guided tour of the main city area, which is not very large. The streets are well-geared to pedestrians, and everything looks very neat and well-preserved. The buildings are very uniform in style and colour. We were already completely in awe of the monumental fountain with its statues of horses at the Place de Quinconces. As other reviewers have remarked, there are no really outstanding buildings that warrant a separate visit. The most interesting structure may be the Cathedral. This is part of the French Routes to Santiago de Compostela also, and I think that it fits that label better because of its age. There are lots of smaller things to see and do however in the streets of Bordeaux: the pastry shops, the plentiful terraces of its bars and restaurants, the well-stocked shops (I bought some smelly cheese to take home with me! ), the Jardin Public. Combined with especially sunny and warm weather for early October, we had a good time in Bordeaux. When our car crossed Pont de Pierre and we saw the whole skyline with the long row of stately buildings along the Garronne and Porte de Bourgogne at the end of the bridge was like a symbolic city gate, Bordeaux welcomed us with its really grand appearance. This was my second time I visited Bordeaux, but last time I travel by train and did not have a chance to see this fantastic view. After hotel check in, we drove our car to see the city, the traffic was really bad as there were many junctions and the new tram system also added more traffic lights. 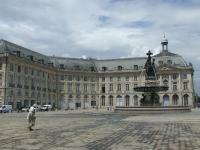 Bordeaux’s city center was like little Latin Quartier of Paris with many fine buildings, nice but nothing remarkable. In my opinion the only part of the city that made Bordeaux stunning is the riverside, all the beaux art buildings seem to be transported from Paris grand boulevards of Baron Haussmann. The crescent shape of the riverside made the whole view of these buildings more magnificent and looked endless. We decided to park our car near Place des Quinconces that unfortunately closed for preparation of city festival. 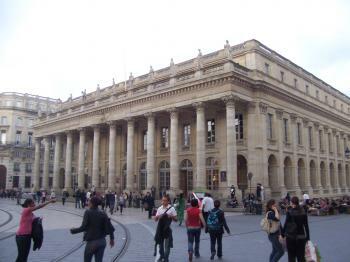 We walked to see the famous Place de la Bourse, the square was indeed very grand and the best sight of Bordeaux. The riverside terrace was a popular place for evening exercise, I saw many joggers, cyclists and many safety patrols. Flèche Saint-Michel, the gothic tower of Basilica of Saint Michael was a landmark dominating the southern part of Bordeaux while the twin towers of St Louis des Chartrons Church marked the nice visual landmark of the northern part. To our big disappointment, the much photographed Le Miroir d’eau, the modern fountains and pool that create the water reflection view of Place de la Bourse were not opened and the pool was dried. Then we walked around Place du Parlement to find a place for food. After lovely dinner, we walked back to Place de la Bourse to see the beautiful night view of the whole riverside buildings before we backed to our hotel. In the morning we went to see Place de la Victoire for another city gate, Porte d’Aquitane and Marche des Capucines, the big market hall to see many local fresh products and Bordelais lifestyle. Before we departed the city to Poitier. Even though Bordeaux is a great city and beautiful, I did not see anything remarkable as in my opinion the city was like a small copy of Paris. Even its skyline was strikingly similar with Parisian skyline height control. But again compared to other big regional cities in France, like Toulouse, Lyon and Marseilles, Bordeaux really look different for its grand and prosperous appearance of beaux art riverside. Since World Heritage Site of Paris is only limited to the Seine Riverside and excluded many grand beaux art avenues i.e. the famous Champ-Elysees or Boulevard des Capucines, then the grand buildings along the quay of Bordeaux and its city center seem to be unique indeed at least among current UNESCO's list. I visited Bordeaux in March 2014. The view of the Port while strolling on the Pont de Pierre is already something to behold. Numerous spires, steeples and elegant buildings adorn the waterfront of the Garonne river. Place de la Bourse is magnificent - the epitome of symmetry and beauty. Not only is it a wonderful sight, effortlessly accessible with the modern Bordeaux trams, but it is in a way enhanced with a touch of innovative genius. Just opposite, every now and then, the open space of the wide waterfront transforms itself first into a flooded space or giant puddle, then in an enormous mirror which depicts a surreal reflection of Place de la Bourse and then a spray fountain which slowly but surely fades away into thin air. It's not the only square to visit though - Place des Quinconces, Place Gambetta, Place de Bourgogne, Place de la Comedie, Place Jean Moulin, etc. 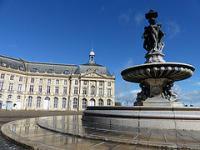 Bordeaux is one of those cities in France that enjoy double inscription in the Unesco WH list. The Routes of Santiago de Compostela in France WHS includes Cathedral of St. Andrew, the Basilica of St. Michel and the Basilica of St. Seurin. Inside the latter, peregrinos can write their names and prayers on a peregrino guestbook inside one of the minor chapels inside the basilica. For 5,50 euros I climbed the 231 stairs of the Pey-Berland Tower and from the top I could afford incredible panoramic views of Bordeaux and a bird's eye view of the Cathedral. All in all, Bordeaux is a very interesting city for a long weekend break and a good base to visit other WHS or national sites such as the Dune of Pilat. 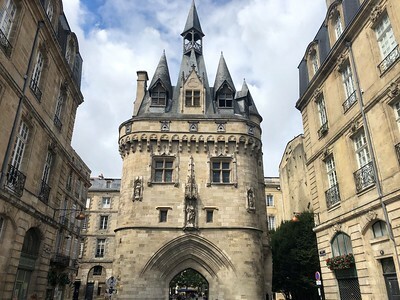 As the other reviewers have pointed out, Bordeaux is a very pleasant city with many fine monuments and sights, and it is certainly a good base for exploring the many attractions in the surrounding area. There are several historic buildings, a large number of churches, and a fine riverfront to be explored. Even though there are no standout sights (except maybe the Monument aux Girondins at the Place des Quinconces), Bordeaux has a well-maintained centre stretching along a bend of the Garonne River (somewhat shaped like a crescent, hence the name "Port of the Moon"). The massive Cathedral of St. André, as well as the basilicas of St. Michel and St. Seurin, are also part of the Route of Santiago inscription. I found Bordeaux to be a great, medium sized European city, though it has some lovely buildings there are no real stand out monuments. The large uniform buildings do not seem to be over-powering and the streets are reasonably sized so it doesn't feel intimidating like Paris sometimes can. For me one of the real joys of travelling in Europe is losing time in great cities like this, they do not have the masses of tourists like the continents star attractions but still showcase the architecture and lifestyle that make this such an interesting part of the world to travel in. My first view of the city centre was the broad sweep of buildings facing the river, from here it is easy to understand the moon shaped layout of the city centre. Perhaps my highlight was strolling aimlessly along St Catherine Street watching everyone else doing pretty much the same. I also enjoyed a lovely wine-tasting session, allowing me to sample the region's most famous export. I would like to suggest this was a cultural quest to get myself better acquainted with the product that led to the development of such a grand port, however I would be lying, it was just because there are few things like more than relaxing with a glass of wine, a newspaper and a plate of cheese in a foreign city. 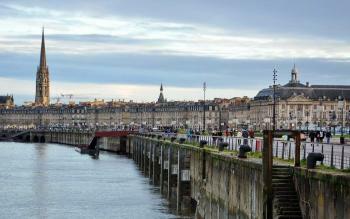 Bordeaux also deserves top marks for the way in which it has presented its city centre. Obviously a lot of time and money has been spent in developing the new trams system, installing wonderful lighting and street furniture. The cynical amongst us may say this is just a vanity project of a shady politician, but there is no denying that it presents the city in the best possible light and makes it a rewarding place to while away a day or two. Bordeaux does have some nice sights, however it is the exceptionally well planned and presented layout that makes this such a charming city to spend time in, and I would have no problem going back. English garden: Jardin Public: "Under Napoleon III the gardens were transformed into a traditional English formal garden, and extended. This is the present form of the gardens." Notable Bridges: Pont de Pierre (1822), a stone bridge in French Classical style and with nineteen arches, more than 500m long.